Autumn by the bay, the leaves are turning colors and there is a gently rain of large maple leaves softly floating down to the ground. As Halloween approaches and pumpkins are everywhere it is time to start baking and cooking with pumpkin. 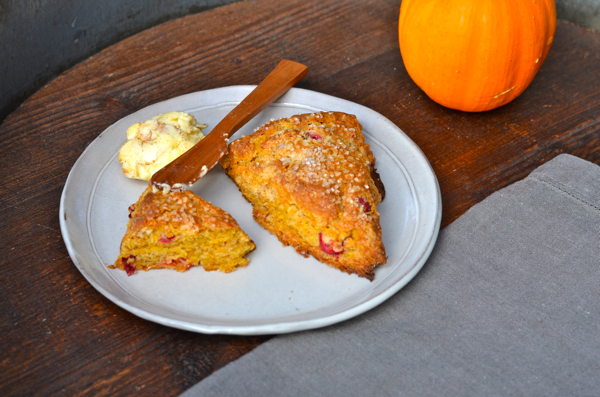 This year I wanted to make pumpkin scones. I looked at many recipes, before I decided on the recipe below. Let me just start with that this scone is perhaps one of the best if not the best scone I have ever tasted. Yes, I absolutely mean that! 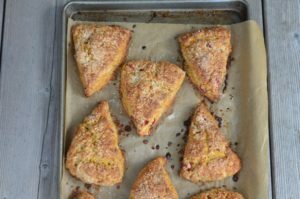 The scones are light and airy not too sweet and a subtle taste of tart from using fresh cranberries over sweet dried cranberries. I loved the technique of grating the cold butter into the dry ingredients and plan to experiment more with this technique since the results were so wonderful. This recipe is really easily , just a few extra steps but the results are worth it. Save some time in the morning, by measuring all your dry ingredients in advance and leave in a zip lock bag until you are ready to bake. From by the bay , wishing you many delicious pumpkin food memories! Mix butter, maple syrup, cinnamon, and salt in a small bowl. Do Ahead: Cinnamon butter can be made 4 days ahead. Cover and chill. Whisk granulated sugar, baking powder, ginger, nutmeg, cinnamon, salt, cloves, baking soda, and 2 cups flour in a large bowl. Using the large holes on a box grater, grate in butter, tossing to coat in dry ingredients as you go; toss in cranberries. Mix in egg, pumpkin, and ¼ cup buttermilk. Transfer dough to a lightly floured surface and pat into a 1½”-thick disk. Cut into 8 wedges; transfer to a parchment-lined baking sheet. Freeze until firm, 25–30 minutes. Preheat oven to 400°. 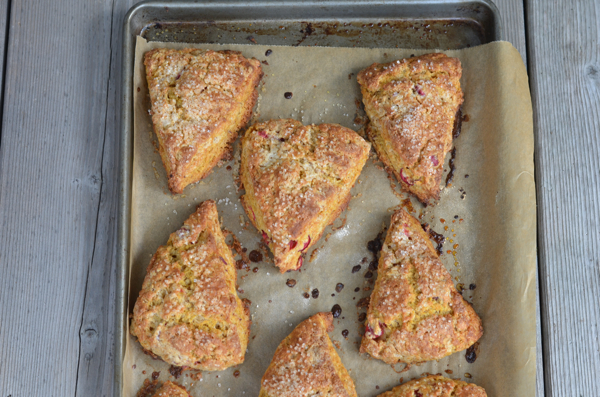 Brush scones with buttermilk and sprinkle with raw sugar. Bake until golden brown, 25–30 minutes. Serve with cinnamon butter. 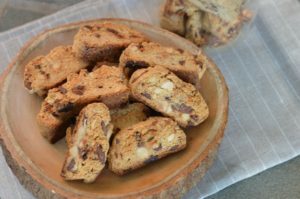 This entry was posted in breakfast and tagged cinnamon, cranberry recipes, ginger, maple syrup recipes, nutmeg, pumpkin recipes, pumpkin scones with cinnamon butter, scone on October 27, 2016 by entertainingbythebay. It’s easier to make the transition from summer to fall if I hold onto some summer in my cooking, while transitioning into fall. This recipe is still light and usually, I still use my grill to prepare the sausages. I have provided an indoor option for preparing the sausages just in case it’s too cold, windy or rainy. This dish is definitely a feast for the eyes . The lovely crimson pomegranate seeds, accented with the warm pink hues of the pickled red onions really celebrate fall flavors. But don’t misunderstand, this dish may look like it’s all about visual pleasure but it’s really about the rich and luscious combination of flavors: slightly salty in contrast to the sweet and sour. Easy to prepare this can become a quick weekday meal. From by the wishing you pomegranate food memories! Light a grill and oil the grate, Grill the sausage over moderate heat, turning until lightly charred and cooked through 10 to 12 minutes. ( Alternately, you can cook the sausage in the a 425 degree F oven arrange sausage on a baking rack set into a baking sheet and bake for 18 to 20 minutes until sausage are cooked through). Transfer to a cutting board and let rest for 5 minutes, then thinly slice on the bias. On a large platter arrange arugula, add sliced sausage . Drizzle with pomegranate molasses dressing. Sprinkle with red onion, pomegranate seeds and almond slivers. Serve at once. In a quart mason jar add all ingredients, shake well. Let stand for at least one hour. Place in refrigerator until ready to use. Will keep for one week. Place all ingredients in a covered jar. Shake well before using . 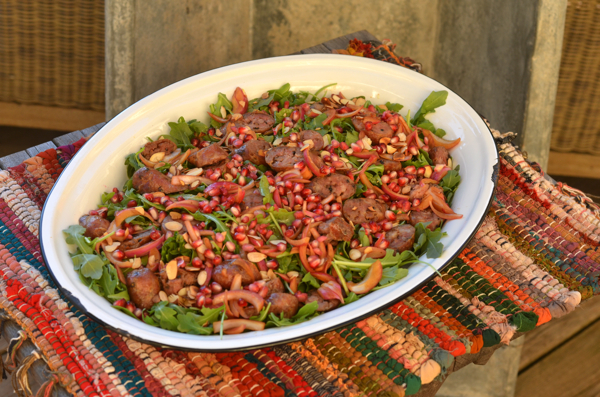 This entry was posted in main dish, pork, salads and tagged fall recipes, pickled red onion, pomegranate molasses, pomegranate molasses dressing, pomegranate recipes, salad, sausage recipes, sausage with pomegranate salad with pickled red onions on October 7, 2016 by entertainingbythebay.